We want to make it clear that, at the present time, there is no cure for stuttering. Yet, HCRI stuttering therapy can help the majority of people who stutter acquire the skills to control their stuttering and speak fluently. The 12-day HCRI treatment program is a premier therapy in terms of quality and results. Research demonstrates that 93% of program participants achieve fluency by the end of their 12-day therapy program. When evaluated one and again two-years post therapy, 70-75% retain their ability to speak fluently. These findings are based on a large-scale evaluation study, which is documented in Chapter 11 of the book, From Stuttering to Fluent Speech, 6,300 Cases Later: Unlocking Muscle Mischief, written by HCRI President and Founder Ronald L. Webster, Ph.D. Many clients come to us after trying other types of therapies, devices and speech programs that didn't work. 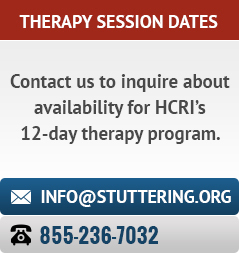 At HCRI, we have a proven track record of treating thousands of people who stutter. We have worked with a broad range of stuttering types and severities. It is likely we have successfully treated someone with a stuttering condition very similar to yours. There is no protocol for predicting how a given individual will progress in therapy. Yet, our statistics indicate that, if you have a desire to do something about your stuttering and possess normal intellectual and sensory/motor functioning, you are likely to experience similar outcomes. We invite you to learn more about our stuttering therapy approach and view the client videos below. Please reach out to HCRI anytime if you have questions or need additional information. Please click on the videos below to view examples of before-and-after therapy results, as well as hear alumni input years after attending HCRI's program. If you are interested in talking with HCRI alumni, call us at 540-265-5650 or 855-236-7032 and we will put you in touch. Or, visit the HCRI Facebook Group page where you can join the group, post and get feedback from former program participants.